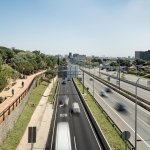 The project is located at one of the most difficult points in the metropolitan road network: the junction that connects Barcelona’s Avinguda Diagonal with Avinguda dels Països Catalans in Esplugues de Llobregat, a barrier for pedestrians and bicycles for sixty years. 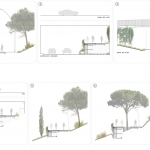 The firm, resolute commitment of Batlle i Roig to soft mobility and a more biophilic city prompted them to design a gently sloping cycle lane in a renaturalised, landscaped environment that acts as a vantage point over the city and connects the urban network of cycle lanes with the system of free spaces in Collserola Park. 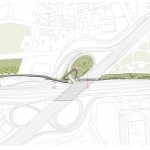 With the aim of impacting the natural setting as little as possible, the project first of all adapts to the morphological characteristics of the place, with its variable topography and infrastructures crossing at different levels, either becoming a walkway with a 5.00 m clearance above vehicles on the slip road or a tunnel through the ring road’s abandoned underpass with headroom of 2.5 m. The new pedal path is further integrated into the landscape by adjusting its slope to the level of the roads and using the retaining system with gabions full of stones from Collserola, positioned directly on the ground to enable a dry-construction intervention that is more sustainable and environmentally friendly. 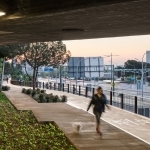 The path is 4.50 m wide and differentiates between pedestrian and bicycle circulation, with two contiguous strips that differ in the colour and texture of their finishes. 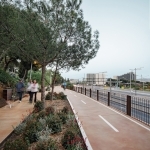 This distribution ensures that the cycle lane (2.30 m wide) is continuous and uniform throughout the entire route and enables pedestrians to relate more directly with nature, thanks to a series of offsets that adapt to the geometry of the sloping verges and existing trees. 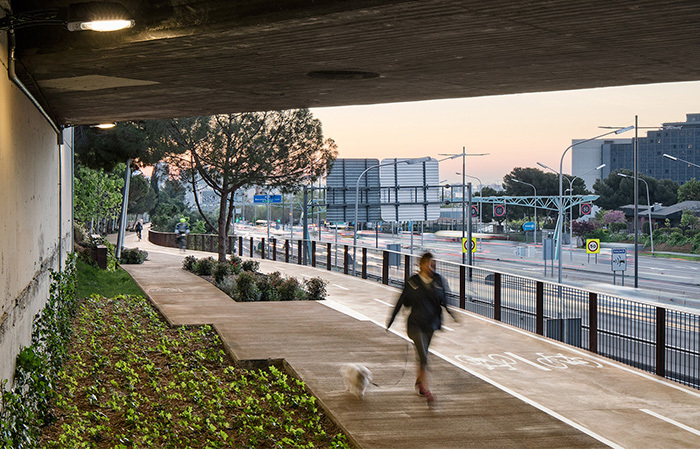 These widened sections of up to 4.50 m form small spaces to rest, equipped with benches, seats and cycle racks, where people can take in the views of Avinguda Diagonal and the city. The ferruginous stone, oxide-treated pavers and the weathering-steel handrail give the whole a unitary identity that stands out from the major road infrastructures and relates well with the surrounding landscaped spaces. All the vegetation chosen for tree planting and landscaping the edges of the track corresponds to native species with low water consumption and seasonal flowering to offer changing colours and perfumes throughout the year. At the same time, great pains were taken to conserve the existing trees and incorporate them into the beds created along the new path. 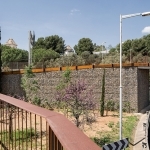 The new pedal path designed by Batlle i Roig has transformed a forgotten space, closed off to people, into a place of meeting and urban continuity for the metropolitan community. 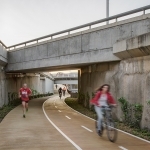 A greenway, with calmed traffc, that evokes country lanes away from the city and major road infrastructures.